7.96 points at 54 votes (rank 91). Rombach 7 1986 - "Voting 3"
Bruce is searching for the evil sorcerer, to defeat him. Different traps and two enemies give Bruce a hard time. The black Ninja, who constantly attacks Bruce with a stick, can easily be knocked out with 2 kicks. The more dangerous enemy is Yamo, who -as Bruce- knows how to do kicks during a jump. You need 3 kicks to defeat Yamo. To get to other rooms, Bruce can climb onto nets, upwards, downwards and sidewards. When Bruce collects all lanterns, doors open and he can get into other rooms. Bruce has 5 lives, to get to the chamber of the sorcerer and to defeat him there. After passing through the game once, the difficulty increases. Yamo and the Ninja will respawn instantly when killed. Additionally, one of the rooms that does not have enemies becomes far more dangerous, with an elimination of "safe spots." Multicoloured 2D-graphics, single screens, which switch when crossing the screen borders. 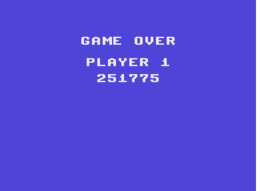 1 player: You are Bruce and you fight against Yamo and the Ninja. 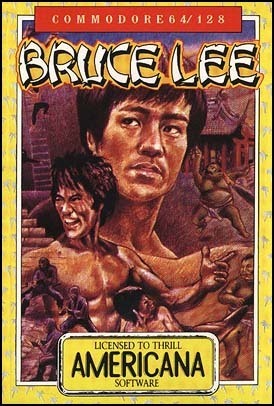 2 players against computer: You are Bruce and you fight against Yamo and the Ninja. If you lose a life, player two is next. 2 players against each other: one player is Bruce and the other is Yamo. If Bruce loses a life the roles are swapped. Load the original program and type POKE 5472,99. Then start with RUN and you have unlimited lives. The version by "Remember" contains next to different cheats (unlimited lives, enemies do not hit), also the manual. Werner: "A classic which is great fun: 9 points from me." TheKills: "Fascinated me for 3 months! It belongs to every good collection." Goondoc: "For me it is incomprehensible that this game is so far at the back of the ranking list. In my opinion it belongs to the absolute top games on the C64. It still fascinates me today although playing through it is no problem any more after so many years." Shakermaker303: "Bruce Lee was the master of Kung Fu as is generally known. At that time I thought of a fighting game in International Karate-style and was disappointed at first, when a clumsy Ninja and a green bull apperared as dim enemies. But then I have learned to appreciate this adventurous game. A really great play, which is also quickly understandable for players without practice. I would not define it as too difficult. It was funny to so send the enemies with a fly kick into the mines where they then died due to the detonation. At first I thought the graphics were a bit strange, but I liked it more and more in the course of time. The sound is kept to a minimum but that is not so tragic. For this game I consider the full 10 points adequate." Blubarju: "Many people believe that this is a mere beat'em up game, when they hear of it for the first time. But far from it! 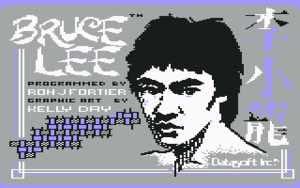 Bruce Lee is in my opinion one of the best jump'n runs on the C64. The grade of difficulty is rather low, which for me personally came in handy, as most of the action games are too hard. The graphics is rather successful and the animations are sufficient. The sound is also absolutely alright, but there is only music in the main menue. The gameplay is brilliant and lets you forget some weaknesses in graphics and sound. I like playing this game every now and then. 9 points from me!" Descore: "No doubt this is one of the best C64 games. It's one of the reasons I keep coming back to the C64 every few years (aside from general nostalgia). The gameplay is fantastic, and the slightly odd graphics somehow manage to convey an immersive atmosphere. Definitely a 10, this game is one of the true classics." Schmitzo: "I freely admit that I hardly ever played a game to the end - except Bruce Lee! But not only because the difficulty grade was rather low, far from that. I died a thousand deaths often enough. Just banging the fat sumo's head was already motivating enough to play it again, even if only for 5 minutes. 10 points." Shmendric: "I did not know the game in the "old days", I only got to know it through the C-64 Wiki and then played it. A really nice gameplay in the type of Zorro and Goonies, all in all a really good game." This page was last modified on 24 May 2017, at 00:58. This page has been accessed 28,198 times.